Printed on 7mil White Static Cling. White Window Clings cling on the back side of the print. White Static Cling: Catch the eye of passersby with a custom White Static Cling. 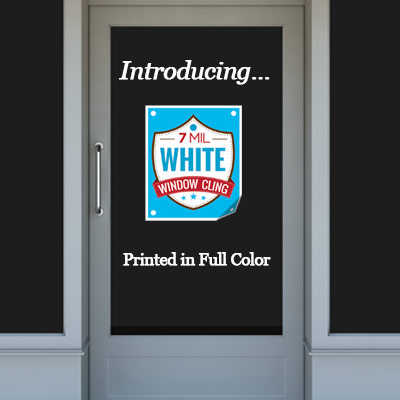 If you’re looking to safely and easily advertise on a store window, mirror, or any other glass surface, rest assured that our static clings never leave any marks or adhesive residue behind. Our static clings rely on static electricity to adhere to surfaces, so you can rely on them to deliver your message with ease. Clings are printed in full color on a quality 7mil White Static Cling. Available in a variety of sizes and in quantities of 1, 3, 5, 10, and 25.